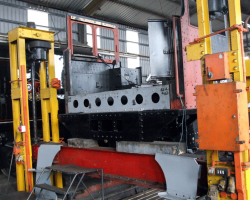 We have reached that stage where dismantling has largely finished, and parts are being permanently refitted to the engine, after either repair or examination. 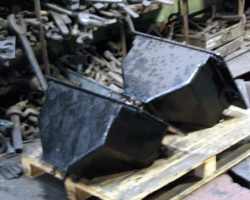 One major item which has arrived but cannot be fitted until the boiler is ready: the new hopper ashpan. 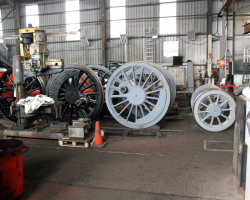 Much work has been done on the wheels since their return from the South Devon Railway, much of it by SVR volunteers, to whom we express our grateful thanks. 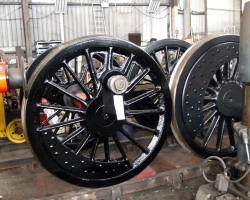 The Wheels seen here closer up. 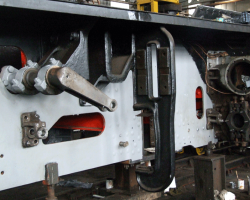 The weighshaft was never physically removed from the engine but all fastenings were released a long time ago to allow the SVR fitters to examine it and make any necessary repairs. The examination has now been completed and all was found to be in order. The fastenings have now been retightened and fully split pinned. 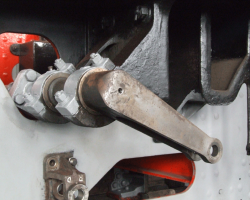 The stretcher locating the pony truck pivot has now had its temporary nuts and bolts replaced by permanent rivets. 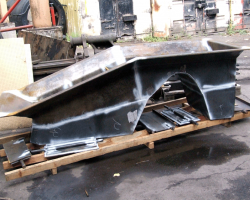 The brake hangar brackets are being returned to the frames. 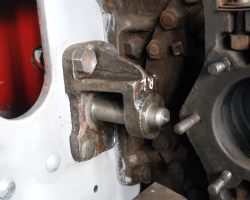 These are secured by fitted bolts, the lower pair having their heads ground down to clear the hanger itself. 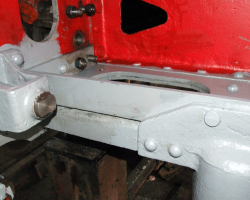 The pony truck has also been the focus of the riveters’ attention and the new steel is now permanently attached and, needless to say, has also been attacked by the Fund’s painters..
More platework returned to the footplate end of the loco. 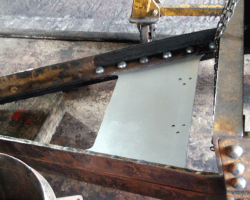 The two leading sandboxes are located between the frames and were removed to allow access to the pony truck pivot stretcher. Their time for replacement is close.